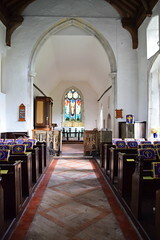 St George sits in an area with some of the best small churches in England, and so perhaps it is not surprising that it is not a well-known church. Neighbouring Bacton is a busy suburban village, but Wyverstone is very much in the foothills of a vanishing rural idyll. To cycle to it through late summer fields that swell on either side of the lane is like coming up for air. 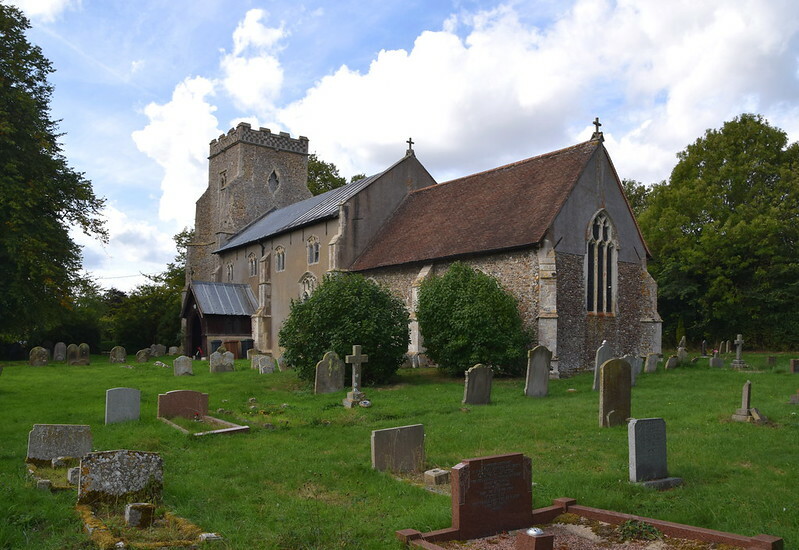 And Wyverstone is lovely too, and one of its delights is St George, a quirky little church, with none other in Suffolk quite like it. The setting is super. Whoever it is that lives in the cottage to the south is very lucky indeed. The 14th century tower has a wide eastern face, and the high clerestory lifts against it. However, there are no aisles, the clerestory floating somewhat adrift, aand so the main impression you get is one of height. 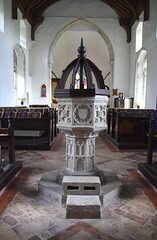 This is a tall, thin church, but on a small scale. 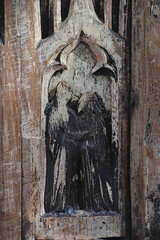 The wooden porch and gargoyles make it atmospheric, thoroughly gothic. You step inside to light, not surprisingly, given all the windows. The star attraction here is the early 16th century roodscreen. At first sight, it is a bit battered, and everything above the dado has been destroyed. 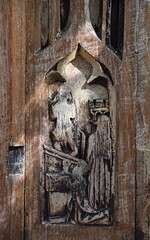 But, here perhaps a century after the majority of Suffolk screens had been installed and painted, is the only rood screen in situ in Suffolk where the figures are carved in relief. And what a fascinating sequence they are! There were once eight panels, four each side. 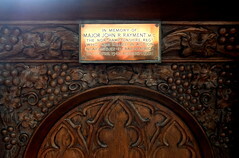 Only two of the panels on the south side survive, the gap plugged by a piece of early 17th Century panelling. 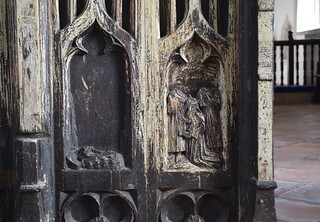 On the north side are the Annunciation to the Blessed Virgin, and what was probably the Adoration of the Magi, although this last panel has been particularly vandalised by Anglican or Puritan vandals in the 16th or 17th century. 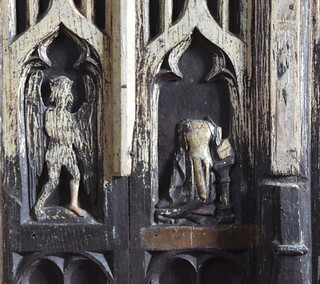 All that survives on the left is the base of the stable and what might be a donkey feeding, with the three headless figures in the right hand panel, one of them kneeling. On the south side, the southern panel is a gorgeous Visitation, with Mary and Elizabeth both voluptuously pregnant. These three scenes were part of the common medieval rosary sequence - as, indeed, they are today. 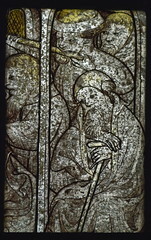 The fourth panel, the left hand one on the south side, is probably the most interesting of all, since it portrays the medieval legend of the Mass of St Gregory, which was used as a comfort to those who found their faith in the Eucharist shaken. St Gregory kneels in the sanctuary, and the risen Christ appears in bodily form on the altar above him. Assuming the two lost panels were also intended to be rosary meditations, they might have depicted the Assumption of the Blessed Virgin or the Coronation of the Queen of Heaven - this would have marked them out as clear candidates for destruction. 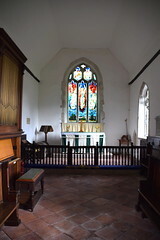 It seems likely that the two surviving panels on the south side were once to the south of their present position, and the two lost panels were beside the entrance to the chancel, matching the Adoration of the Magi. Curiously, the panel that once formed the left hand side of the Adoration of the Magi, and thus held the Holy Family, has the ghost of a figure painted in the background, and it is hard to know how or when this happened. Was the panel replaced from elsewhere? Was it painted after the destruction, during the Marian years? 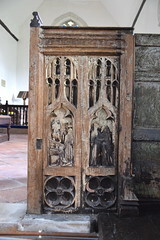 Or, more excitingly, was this roodscreen painted with figures before the reliefs were added? 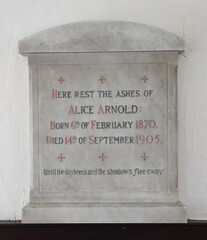 The nature of the reliefs suggests that they were intended for very late medieval devotions, and they may indeed have replaced a sequence of Saints. Although this screen is remarkable, there are several other features which are of interest. 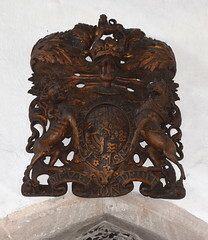 Wyverstone has two sets of royal arms, and neither of them are run of the mill. On the west wall of the nave is a richly carved and ornamented set of arms for William III, dating probably to the very first decade of the 18th Century. Cautley thought it was the best set for them in the country. Meanwhile, on the north wall there is another set, ostensibly for George III, and dated 1812. But look closely: The G is floriated, and was almost certainly a C originally. 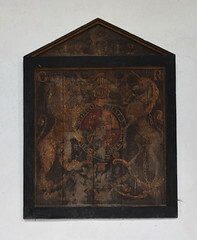 A couple of miles off at Westhorpe there is a similar set, which, although clearly painted by a different artist, have the same triangular pediment, There, the arms are dated 1751, and are charged for George II, but showing through the overcoat of paint are the letters C R and the date 1602. The screen is not the only medieval survival here. High in the south window lights are four ghostly figures, damaged composites so vague as to hardly be there, until you notice that the second one points with a finger at a missing symbol, perhaps the instrument of their martyrdom. In much better condition is a fragment of a panel, probably continental, depicting the Adoration of the Shepherds. 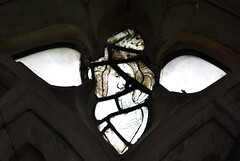 Above it is a fragmented and ghostly head of Christ. 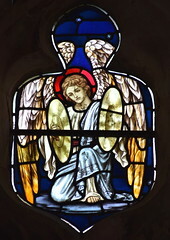 Rather less vague and fragmentary is the splendid 1926 east window by William Glasby, of the Ascension of Christ adored by angels. 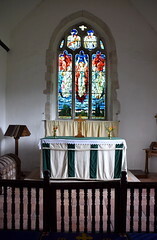 Aidan Mcrae Thompson tells me that the central figure of Christ is a design Glasby reused in many of his windows, including one at Ilston on the Gower Peninsula identical to the centre light here. The effect is something like the work of Henry Holiday from three decades earlier, and it is not surprising to learn that Glasby was a pupil of Holiday's. The window is boldly sentimental, and quite late for such confidence. The angels are gorgeous, but the central figure of Christ looks unfortunately as if he is reaching up to take something down from a high shelf.